Durability and a long lifespan are two of the most basic parameters for choosing a new door for your garage. Amarr garage doors are built to last! Our experts wouldn't order products from a company with ambiguous quality parts and materials. Amarr invests in high-quality materials and has patented special door parts for reinforced systems. 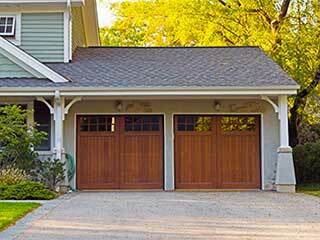 When garage doors are made of good and resilient materials, they will last for a longer time! The innovative idea of Amarr to create new style hinges and plates for extra strength reinforces doors and ensures security as well as safety. Amarr constructs garage doors of different materials. From natural and composite wood to vinyl and steel doors, the results are always amazing. Their durability is their main asset. Of course, steel is always the best choice for higher strength and stability. They offer single, double and triple layer steel doors and the company reuses recycled steel in many of its products, in order to be as eco-friendly as possible. Their doors are constructed with meticulous attention to detail, high energy efficiency, and low maintenance requirements. Amarr gives particular attention to the system's various parts, which secure the door and ensure its stability, smooth operation and long-lasting effects. They offer heavy duty, strong 14 gauge steel roller carriers, which are thick and powerful enough to control the movement of the door better and ensure its long lifespan. Roller carriers and hinges of triple layer panels are secured with a specially made backer support plate of 20 gauge steel which enhances the door and minimizes the need for garage door service. One of its patented products is the high-end garage door hinge, which is made of 14 gauge galvanized steel. Hinges of this type are powerful enough to keep the door strong for long and, thus, extend its lifespan. They are also quite safe, as they don't leave enough room for fingers to slip through, thus preventing potential injuries. In between the sections of Amarr's steel doors, there are thermal seals which serve for insulation purposes, as well as to ensure soft movement and extend the lifespan of the door. Amarr panels last longer thanks to their careful painting procedure, too. The rugged steel panel is hot-dip galvanized, which coats the material in order to make it resistant to corrosion. The panel is then treated with a special varnish which prepares it for the actual painting before the primer and finishing coats are applied. If you combine the excellent coatings, with the unique low gauge steel components used for extra support, and also add the quality of the materials, you can be sure that your Amarr door will last for a very long time. Their products can cover all sorts of different needs, and they even construct doors that can withstand storms.You can be certain that our experts at Garage Door Repair Palatine will help you find the perfect door for your home. Call us today.